My peoples. My lovely, lovely peoples. I am selling some stuff. Like everything in my living room. For the local (KC Buyers) only, I think. I will most definitely ship the drapes. But the big items, are strictly limited to my City of Fountains audience. Get it while its hot. While it is sometimes hard to say goodbye to my beloved stuff, I can't think of a better home for it than with you love muffins. First up. My sectional accompanied with fainting couch (my dramatic reference) from Home Decorators. Basketweave material, charcoal with natural piping. Oh so attractive. 38" D x 28" H x 102" W. Sectional portion is 64" L. $500 for sofa. I will consider selling pillows. Striped pillows are Furbish Studio. Greek key lumbars are Jonathan Adler. Next. This awesome campaign coffee table that I honestly love more than life itself. We have to keep changing though, people. If you aren't changing you are dying. Coffee table is 56" x 23" of black lacquer and gold adornment. $300. And another one. This thing was meant to be styled. 3 panels for sale. Pole pocket. Mustard-ish color. 96" in length. *Update. All of this for sale as well! From L to R: Furbish pillows. 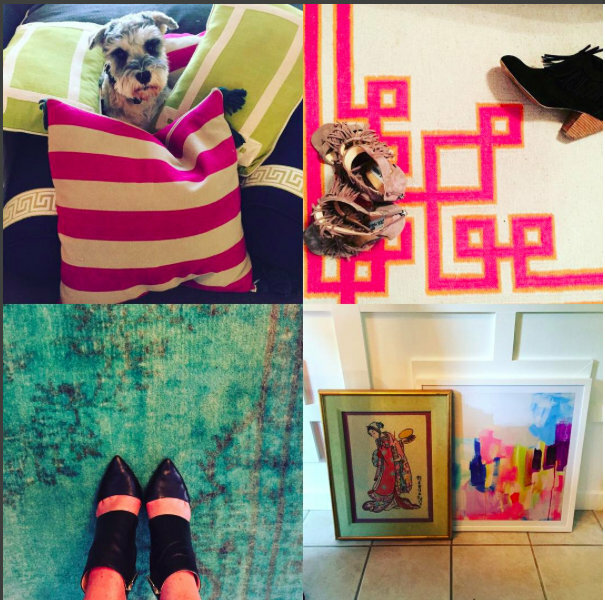 Bolsters $50, Striped pillows $25, Greek key Jonathan Adler lumbars $10 each. Z. Gallerie greek key rug $200, 5'x8'. Overdyed turquoise rug 5'x8'. Art. Chinoiserie needlepoint $60. Michelle Armas brushstroke abstract 24" x 24" $200. Hey little strangers! Alright. It's that long holiday weekend and I decided we all need to start planning our next getaway. Ya feel? So first and foremost, my friends over at the Radisson Hotel brand have decided that you fine people deserve a stay in one of their amazing hotels. What is the catch? Well there isn't one. Just being an S+S reader puts you right to that top of the pile. Enter in the giveaway below, I know such a drag, for your chance to win a free night's stay. Throw that hat in the ring. In addition to free lodging you could win, Radisson Blu has a design contest that is going down that involves all of you creative people and customizing your own chair that will be potentially featured in one of their hotels! Oooh and aaaahhh. 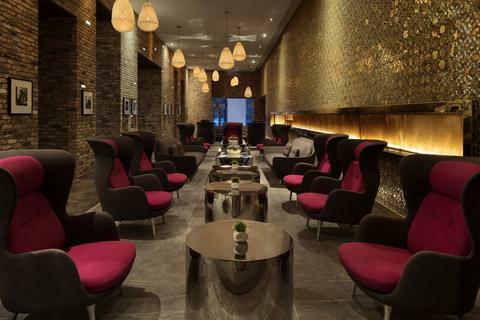 Recognized as a leading designer hotel, Radisson Blu is launching a global design contest starting now to October 13th inviting participants to customize the iconic Egg™ chair, originally created by the legendary Danish architect and designer, Arne Jacobsen, for the SAS Royal Hotel, Copenhagen. Radisson Blu guests and design enthusiasts will have the opportunity to design their very own egg chair using an online configurator at Design Radisson Blu. 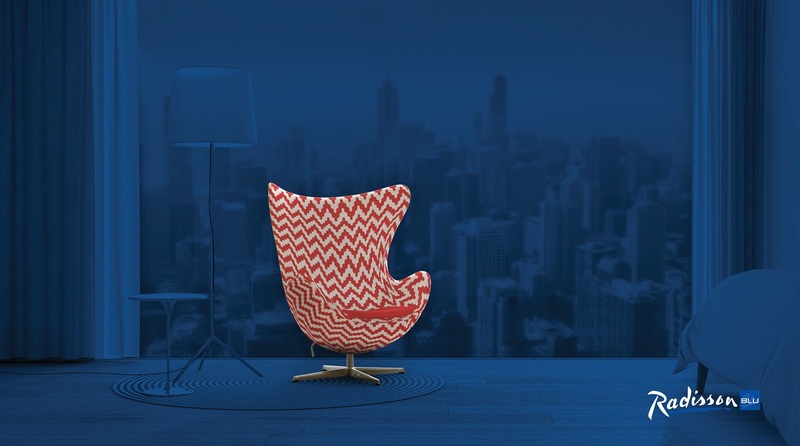 Each week finalists will be selected to compete in a final round judged by an expert panel and the winner will receive a customized egg chair based off their design and a 3-night VIP trip to Copenhagen, Denmark. Additionally, the winning design may also become part of the brand’s new interior design scheme which will launch later this year and the top 15 final designs will be displayed at select Radisson Blu hotels as part of a 2016 miniature travelling exhibition around the world. You guys. Let us all talk about where you are going to stay. 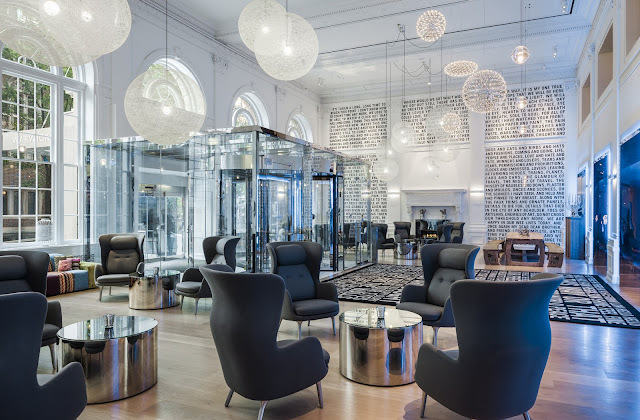 With more than 280 Radisson Blu hotels and resorts in operation in 62 countries, the brand provides a full range of innovative design led products and services, delivering genuine and relevant guest experiences with a distinctive Yes I Can!SM philosophy. 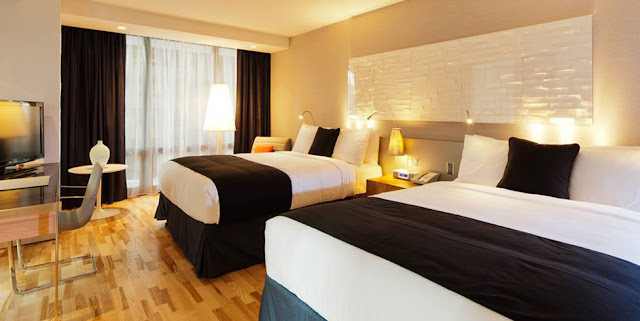 Acclaimed hotels currently in the Americas include: Radisson Blu Aqua Hotel, Chicago; Radisson Blu Mall of America; Radisson Blu Philadelphia, Warwick and Radisson Blu Minneapolis Downtown. For more information and contest rules please visitdesign.radissonblu.com. See what I am saying? Get involved. Create some stuff. And lay your head down at one of these swanky hotel motels. Enter below my loves.